Essex County Council, like most other councils, spend a lot of money processing paper. Some of that goes on administering Blue Badge permits that allow disabled drivers to park closer to where they’re going. With the continued pressure on public service budgets, it’s hardly surprising that they should want to look at whether they can reduce their costs and make the process cheaper and more efficient. An obvious way to do this is to get people to renew their permits (and do an array of other things) online rather than more expensive face-to-face or paper based administration. So we set out to help them test, through a Randomised Controlled Trial, whether small changes to the Blue Badge renewal process could encourage channel shift – that is moving people from one channel (paper/face-to-face) to another (online). The results showed it worked – passing standard tests of statistical significance. Just by making small changes to the renewal letter that goes out to Blue Badge holders we managed to reduce the numbers of people that renewed by post by almost 20% (8.6 percentage points). And because we used an RCT to test it, we can be confident that the difference can be attributed to the changes we made to the letter. By simplifying the letter – stripping away anything we didn’t feel was absolutely necessary to include and making it clear to the reader precisely what they had to do – we made it more likely that people used the online renewal process. Martha Lane-Fox, in her 2010 role as Digital Champion, looked at the costs (and savings) of government conducting business online, rather than face-to-face and paper. She estimated that the public sector would save £12 for every transaction conducted online rather than by post. For Essex that figure would mean that this small change to the renewal letter will save them around £20,000 a year. Of course set against cuts of £50m this year it’s a drop in the ocean. But if every service or process were able to find similar efficiencies for a fraction of the costs of implementing them it would soon add up. 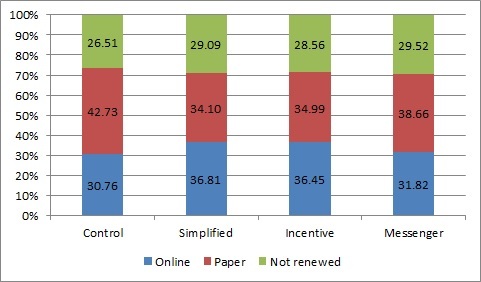 Simplification wasn’t the only effective way we found of reducing paper renewals. We also found that by telling people that renewing online saved the Council money and helped protect frontline services also encouraged channel shift. This small change in the renewal letter reduced paper renewals by over 18% (7.7 percentage points). The RCT gave the Council strong evidence of what works, enabling them to adopt the simplified letter as their new standard renewal letter. 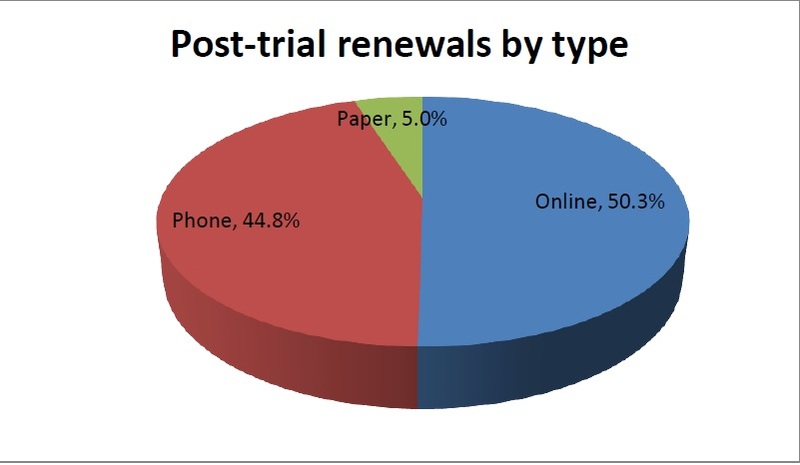 Since they did so, only 5 percent of renewals are done by post, with over half of all renewals now being done online (the remainder are done over the phone). The trial has helped the Council move toward online renewals for blue badges and we hope it can act as a model for the more general transformation of services across the council. When did it become trendy to start slating randomised controlled trials?